Swarthmore coach Landry Kosmalski with his team. Monday’s practice would start at 5 o’clock, but the gym was still empty. Possibly 5:05, Swarthmore College men’s basketball coach Landry Kosmalski had mentioned. They were coming from the film room. At 5:05 and 10 seconds, they appeared at a full sprint, a hoops team preparing for the summit of its sport: this weekend’s NCAA Division III Final Four. Their entrance into the gym was precise as their play, right down to the plastic water container each player put in a corner of the gym as he entered, lining it up with the container next to it, fiddling to make it just so. They’d have two water breaks over the next two hours, each for “.75 min,” as the practice plan showed it, while the scoreboard ticked off 45 seconds. On the court, not surprisingly, everything was just as precise. Kosmalski, a former Davidson player and assistant coach who has engineered one of the most amazing rises in college basketball, any division, had put down taped X marks around the gym as landing spots for players. As Monday’s workout began, he decided he wanted the spot to be more exact, running around adding another strip of tape, apparently to give room for a player to stand between the two marks. If you walked in the gym not knowing Swarthmore was going to the Final Four or what school the Garnet were playing, you walked out with the same knowledge. There was no rah-rah stuff during practice, probably nothing different from before Swarthmore had played Ursinus or Haverford. Point of fact: Swarthmore, ranked sixth nationally, will play Christopher Newport, ranked ninth, at 6 p.m. Friday in Fort Wayne, Ind. If the Garnet win, they will play at 7 p.m. Saturday for the national championship. This whole thing is like a movie script. Swarthmore used to be proudly awful at sports, including basketball, for years, even dropping football entirely. However, academic brethren such as Williams and Amherst had shown you could compete in D-III sports and maintain your academic haughtiness, and Swarthmore has followed that path. Swarthmore head basketball coach Landry Kosmalski during a game. At Swarthmore, Kosmalski won seven games in his first season of 2012-13, then eight games the next, 11 after that. As he got his own recruited players in, the light switched on, with 22, 23 and 25 being the new win totals. This season, the Garnet are 28-3. You can sniff the Davidson influence in all the cutting and screening and reading of defenses, and sometimes that has turned into a statistical marvel. In this season’s NCAA second round against MIT, Swarthmore made 24 of 27 shots in the first half, including all 10 three-pointers tried. Even at practice, good luck figuring whether a cutting player is about to set a screen, receive one, or cut in an entirely different direction. A lot of D-III programs can score, however. Swarthmore finished fifth nationally this regular season in Division III field-goal percentage defense. You could see at practice how that happened, too. Drills weren’t simply about setting screens, but the other guys on defense working on blowing up screens. This far into the season, it was still a laboratory in progress. “Also, give me a little dig off the corner,’’ Kosmalski called out at one point. “He was open a second ago,’’ the coach pointed out another time. The energy in the gym Monday was contagious. 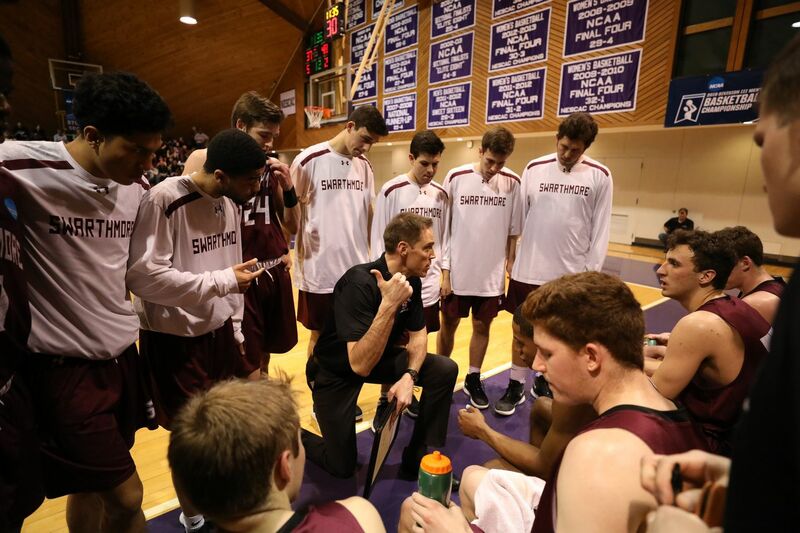 Whether Swarthmore was working on fighting for space inside (45 seconds) or protecting the rim (40 seconds) or one-on-one defense, with emphasis on “no surrender, no crack” (2 minutes), players paid absolute attention to each task. There was nothing “Division III” about it. Manager Sariah Cochran, a sophomore, had to be as tuned in as any player adjusting the scoreboard clock. When they went five-on-five, players even mimicked going to the scorer’s table to check in. When the team first came out on the court for the practice, Kosmalski immediately had the players in positions, going over a new look for a specific play. And those water containers lined up just so? At Division III Swarthmore, the water bottles are lined up with precision, and Alfons is along for the whole ride. The idea was obvious: If you’re going to do something, do it exactly right. Anything else they picked up from this group? Don’t get the wrong idea, Swarthmore hoops hasn’t turned into a grim mission. In front of the water containers, one of the players rushing into the gym had placed a stuffed toy, a man who appeared to be a Friar. “That’s actually a team thing,’’ the coach explained, how “Alfons” had been given to them on a team trip to Sweden in 2016. Now, it’s a symbol of achievement, passed around to players for specific contributions. This day, Alfons was the property of sophomore Conor Harkins because his loose-ball rebound, a pure hustle play, had secured Saturday’s 69-65 victory over Nichols in the NCAA Elite Eight. Swarthmore guard Cam Wiley, the team's leading scorer, shooting in a victory over Mitchell on March 1. There is inside-outside balance to how Swarthmore plays. Four players average double-digit scoring, led by guard Cam Wiley, a 6-foot senior from Atlanta, who scores 14.7 a game and also leads the Garnet in assists. Zac O’Dell, a 6-7 junior from Schenectady, N.Y., averages 13 points and leads with 8.1 rebounds a game. Precision and toughness are pretty fair hallmarks of any good team, any sport, any level. The toughness came through at Monday’s practice. In several drills, Swarthmore coaches held up what looked like football blocking dummies, forcing big men to get through contact with the dummies to score inside. They did, continually. The coaches had found the dummies in a closet some years ago, Kosmalski explained — maybe the last remnant of Swarthmore’s defunct football program? At the least, a reminder that it is possible to make something out of what had long been written off as nothing.